Many legal theorists maintain that laws are effective because we internalize them, obeying even when not compelled to do so. 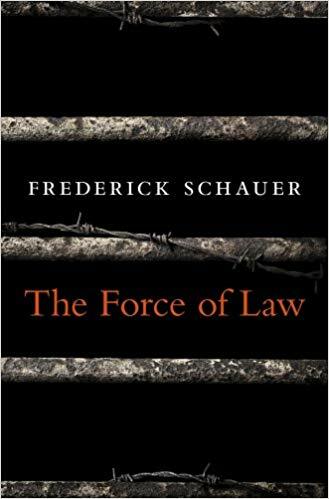 In a comprehensive reassessment of the role of force in law, Frederick Schauer disagrees, demonstrating that coercion, more than internalized thinking and behaving, distinguishes law from society’s other rules. Reinvigorating ideas from Jeremy Bentham and John Austin, and drawing on empirical research as well as philosophical analysis, Schauer presents an account of legal compliance based on sanction and compulsion, showing that law’s effectiveness depends fundamentally on its coercive potential. Law, in short, is about telling people what to do and threatening them with bad consequences if they fail to comply. Although people may sometimes obey the law out of deference to legal authority rather than fear of sanctions, Schauer challenges the assumption that legal coercion is marginal in society. Force is more pervasive than the state’s efforts to control a minority of disobedient citizens. When people believe that what they should do differs from what the law commands, compliance is less common than assumed, and the necessity of coercion becomes apparent. Challenging prevailing modes of jurisprudential inquiry, Schauer makes clear that the question of legal force has sociological, psychological, political, and economic dimensions that transcend purely conceptual concerns. Grappling with the legal system’s dependence on force helps us understand what law is, how it operates, and how it helps organize society.